Here is the fourth and final lunch in my four part series this week of nursery rhymes/songs with sheep/lambs. Little Boy Blue come blow your horn, the sheep’s in the meadow. I did not have room for the cows in the corn. 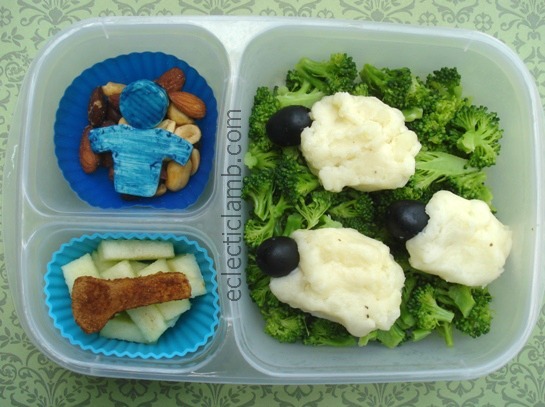 This entry was posted in Bento / Cute Food and tagged bento, lamb, Nursery Rhyme, sheep, sheep themed food, vegetarian. Bookmark the permalink. Nice series! I’ve enjoyed the visuals. Thank you! It was fun to do a series. 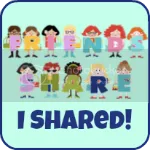 You are so creative at using different ingredients each day in this series. Love the sheep! Thank you Jean for your kind comment and for noticing! I wanted to make sheep 4 different ways. Thank you so much Rina! I appreciate your kind comments. Thank you so much Winnie! Today is the end of this small series but in the future I have other (non-sheep) fairy tale themed lunches planned. 😀 You should publish a children’s book with these bento; they are brilliant! Wow! I never thought about that. Thank you! The sheep idea is cute!! So cute! I love the blue boy and the sheep! very cool. this one is very creative and ingenious!